In response to member inquiries, the National Council on Medicaid Home Care – a NAHC affiliate - researched state adoption and utilization trends of personal care services (PCS) as a Medicaid benefit. 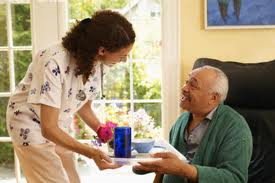 While defined differently by state, PCS usually refer to activities of daily living (ADLs) assisted by a personal care attendant such as bathing, dressing, eating and drinking, grooming, mobility, toileting, and transferring. Personal care attendants usually assist beneficiaries in performing these ADLs under PCS. Furnished in a home, and at the State's option, in another location. For purposes of this section, family member means a legally responsible relative. PCS is an optional benefit that, if chosen by a state, must be provided to all eligible populations in a comparable scope and manner. With optional benefits, states cannot discriminate within the Medicaid population. Also, states adopting PCS cannot limit the number of participants as they can with HCBS waiver programs. The Council reports on key findings of PCS programs as derived from Kaiser data. Kaiser’s data focuses purely on PCS programs. Other data, such as expenditure and enrollment data from Table 18 of the most recent (FY 2009) Center’s for Medicare and Medicaid Services’ (CMS’) Medicaid Statistical Information System (MSIS) Tables, have spending and utilization data on Personal Support Services (PSS) more broadly. PSS includes many services including the specific Medicaid benefit of Personal Care Services (PCS). PSS also includes: targeted case management services, therapy, hospice services, private duty nursing, and others. CMS does not provide expenditure and enrollment data for PCS or the other specific elements of PSS. According to CMS, PSS totaled $25.6 billion in 2009, whereas according to Kaiser, as shown below, PCS totaled $11.1 billion that same year. For a link to CMS’ definitions of PSS and PCS of terms, see pages 159-160, here. Sli​ghtly More States Offer PCS Than Do Not. As of 2010, 29 States, including DC, offer PCS as a Medicaid benefit, while 25 states, including American Samoa, Guam, Northern Mariana Islands, Puerto Rico, and the U.S. Virgin Islands do not. Common Restrictions and Payment Methods. Nineteen of the 29 states that offer PCS as a benefit require prior approval. Most states put some restriction on the benefit, including the duration that is reimbursed. Other states, such as Missouri, New York, and Utah, require RN supervision for the services. 27 of the 29 states reimburse PCS via fee-for-service (FFS), with at least nine of these states reimbursing in hourly increments. Beneficiaries. As of 2009, there were 912,000 PCS beneficiaries, up from 528,000 in 1999, an increase of 42.1%. The states with the five most PCS beneficiaries in 2009 were: California (425,000), New York (75,000), Michigan (59,000), North Carolina (53,000), and Missouri (53,000). Therefore, approximately 46.6% of PCS beneficiaries were in California, 8.2% were in New York, 6.5% were in Michigan, 5.8% were in North Carolina, and 5.8% were in Missouri. 72.9% of all PCS beneficiaries in 2009 resided in these top five states. Expenditures. As of 2009, PCS expenditures totaled $11.1 billion, up from $4.1 billion in 1999, an increase of 62.8%. The states with the five greatest PCS expenditures in 2009 were: California ($4.9 billion), New York ($2.2 billion), Texas ($480 million), Minnesota ($396 million), and Massachusetts ($356 million). Therefore, approximately 44.4% of PCS expenditures were in California, 20.2% were in New York, 4.4% were in Texas, 3.6% were in Minnesota, and 3.2% were in Massachusetts. 75.8% of the total PCS expenditures in 2009 came from these top five states. For links to Kaiser’s statistics on PCS, click here, here, and here. The Council sees PCS as a key vehicle in facilitating the push to re-balance long term services and supports expenditures away from the institution and towards the home and community. The Council supports universal standards for PCS, and for PCS to be covered as a Medicaid benefit in all states. For details, see pages 15 and 25 of our Policy Blueprint, here.